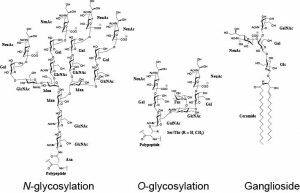 Glycans are oligosaccharides (sugars linked together). Glycans are densely arrayed on the cell surface, playing many biological roles. Studying the biological roles of these glycans is the field of glycobiology. On cell surface, glycans play a myriad of functions. While they can directly modify the function of the proteins or lipids to which they attached, glycans can also serve as ligands for glycan binding proteins (GBPs). One large family of GBPs that the Macauley Lab studies is the Siglecs. 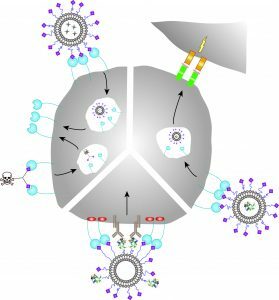 Why are Glycans important in the Immune System? White blood cells express different glycan binding proteins (GBPs), including the Siglecs, which help guide immune responses. The study of glycans in the context of immunology is called glycoimmunology. 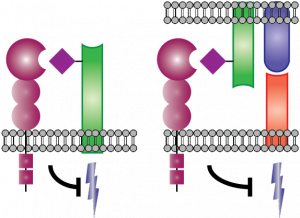 Examples of Siglecs recognizing a glycan ligand on the same cell (left) or on another cell (right) to modulate the response of the white blood cell.For an introduction to Siglecs, see: Macauley, Crocker, and Paulson. Nat Rev Immunol 2014, 14(10), 653-666. What is involved in glycoimmunology-related research? As the biosynthesis of glycans is not template-driven – as is the case for DNA/RNA and proteins – chemical approaches are valuable because (a) chemical and chemo-enzymatic synthesis is required for their preparation and (b) inhibitors of glycan-processing enzymes are powerful means to probe the function of glycans. The Macauley Lab uses a combination of the chemical, biochemical, and genetic strategies to probe the roles of glycans, through the Siglecs, in modulating immune responses. From these fundamental observations, strategies can be designed to modulate immune cells. Examples of ways in which Siglecs can be targeted for potential therapeutic benefit. For an introduction to strategies for targeting Siglecs, see: Angata, Nycholat, and Macauley. Trends in Pharmacolog Sci. 2015, 36(10), 645-660.